Poppadoms are commonly eaten with Indian meals. The best way to cook poppadoms is to fry it. Bhavani Foods (M) Sdn Bhd, the maker of Tajmahal Pappadam, Malaysia’s number one pappadam, has extended the brand into the launch ready-to-eat (RTD) poppadom segment. The new product is sold under the Uncle Saba’s brand and comes in two flavours – tomato and sweet chili. The suggested retail price for the 70g lentil chip is RM 4.99 (USD 1.17) with the introductory price at RM 3.99. 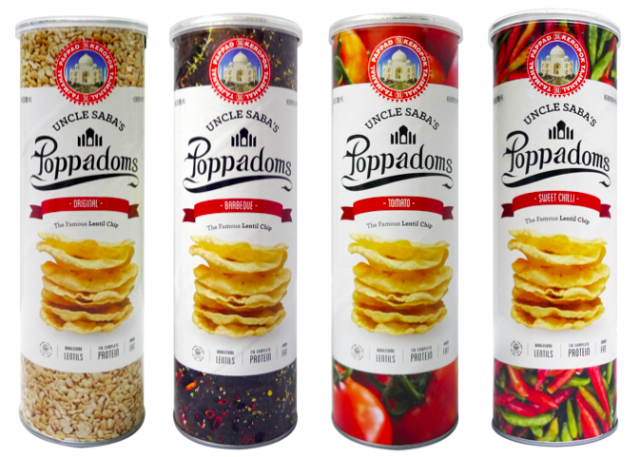 Uncle Saba’s Poppadoms are currently available at Giant and Mydin. 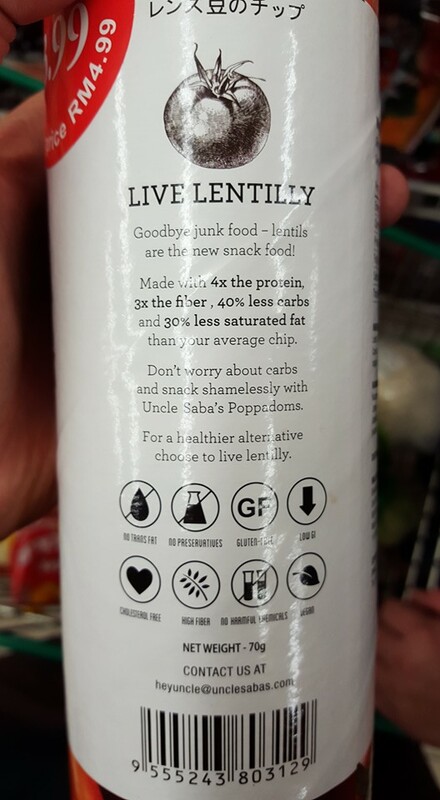 Uncle Saba’s Poppadoms is positioned as a healthy snack. 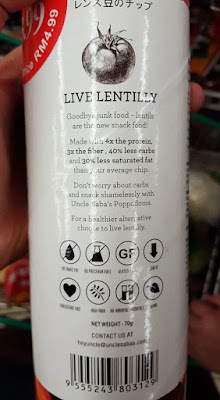 It claims to contain “4x the protein, 3x the fiber, 40% less carbs and 30% less saturated fat than your average chip.” The lentil chip also does not contain trans fat, preservatives, cholesterol and harmful chemicals. It is gluten-free (does Malaysian know about gluten? ), high in fiber and has low Glycemic Index (GI). The key ingredients are lentil, vegetable oil, salt, asafoetida, cumin seeds, carom seeds, contains permitted seasoning (bean flour, spices, sugar and mono sodium glutamate), plenty of love and care [as stated on the packaging]. Uncle Saba’s Poppadoms only carries the Halal India logo, which means it has yet to be certified with JAKIM, the local Halal certifying body in Malaysia. Uncle Saba’s Poppadoms is unique as it fills the gap in the RTD poppadom space. 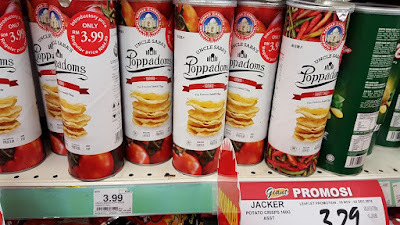 It is also likely to be the only poppadom in canister in Malaysia. The mainstream snack in canister at the moment is extruded potato chips. Other snacks in canister include banana chips, cassava chips and prawn crackers. The health positioning might attract health-conscious eaters looking for a guilt-free indulgence. However, taste is still the most important factor. Consumers have to get use to eating poppadoms beyond the dinner table.